At the end of most Chinese meals, seasonal fresh fruit is often served as dessert. But the cuisine has a number of sweets that are popular at home and here in the U.S., some of which are only made for special holiday periods. 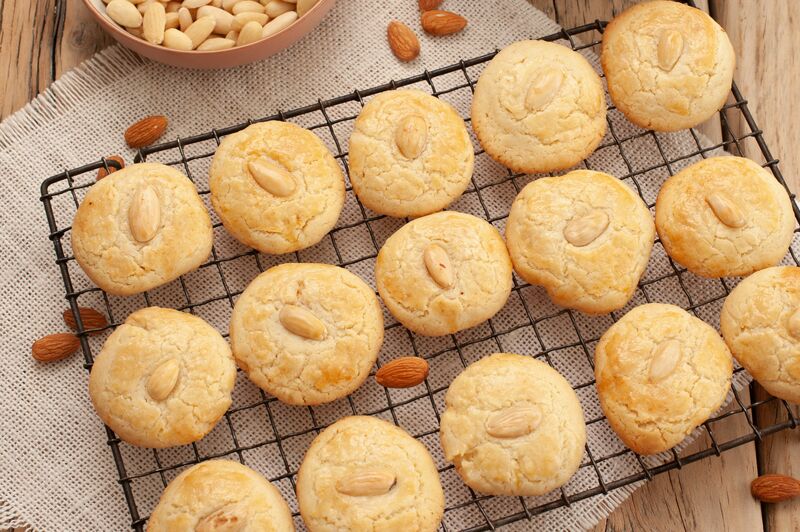 A popular offering at Chinese bakeries, almond cookies are a confection that's surprisingly simple to make at home. The dough is rolled into a log, then sliced and topped with a single almond before baking. They're often served at festivals as well as Chinese New Year celebrations. One of the most popular Chinese desserts is sweet ​nian gao. It is usually made from a glutinous brown sugar cake that's wrapped in pastry and deep fried. Some nian gao recipes add sweet red beans as the main ingredient. This dessert is mainly served during the Chinese New Year period. Named after the number of ingredients, eight treasures rice pudding is only served during special events or for Chinese New Year. It’s made of sweet sticky rice (glutinous rice) with a red bean paste filling. The top of the rice pudding is usually decorated with eight different kinds of candied fruits, then brushed or drizzled with syrup to make it sweeter. To form this dessert, gelatin is mixed with sugar, almond extract, and evaporated milk, then chilled inside a mold. It's sliced and served with a fruit cocktail and syrup mixture. Feel free to use fresh chopped up fruit. It's especially good as a refreshing treat on a hot summer day. Unlike American versions of banana fritters—where the fruit is mixed with the batter, then fried—these Asian-style bites keep the fruit intact, coating them in a thin layer of batter before frying. This dessert is lighter than expected and is delicious served with a caramel sauce and sprinkled with sesame seeds. Children will love these egg roll wrappers, which are twisted and deep-fried, dipped into a brown sugar syrup, and left to harden. Often served cold, the bow ties are a fun and festive treat that can also simply be dusted with powdered sugar, similar to the carnival confection of fried dough. Although not native to China, the mango has become very popular and one way to enjoy this tropical fruit is to turn it into cold and refreshing ice cream. Fresh mango is combined with sugar, lime juice, half and half, and coconut milk, then chilled to harden. For added texture, color, and flavor, sprinkle some toasted coconut on top with a sprig of mint. Similar to a peanut brittle, these sweet and savory nuts are a perfect light ending to a meal—or to sprinkle on top of ice cream or a chocolate dessert. A mixture of butter, brown sugar, corn syrup, and five-spice powder is boiled and cooked to the soft-ball stage; the peanuts are added and the mixture is left to harden before breaking into pieces and serving. What makes this dessert different from a typical sponge cake is that it is steamed, making it extremely moist. Egg whites are beaten until frothy and then the yolks, sugar, and flour are added; a bit of almond extract gives the cake a nice flavor. Once the batter is poured into the pan, it is set in a wok filled with simmering water and covered until cooked. Popular in Hong Kong, mango pudding is often served at dimsum. The texture is smooth and creamy and the flavor is sweet and refreshing. 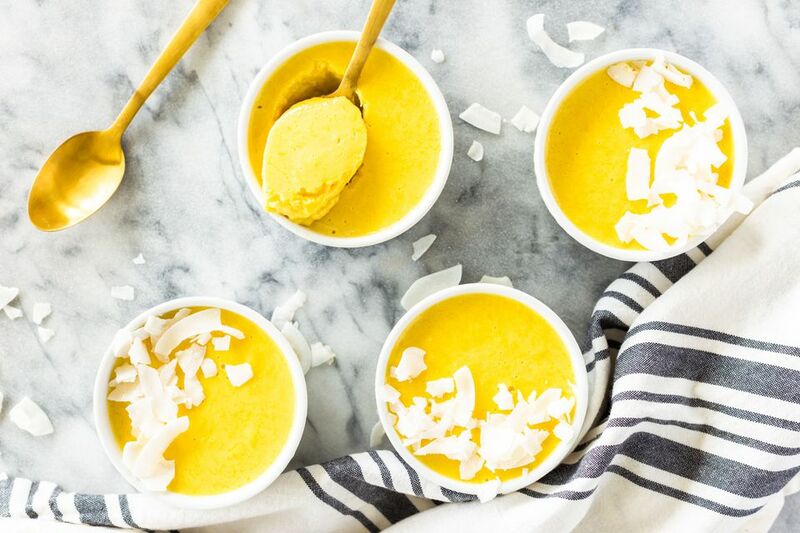 Instead of regular milk, coconut milk is added, which not only makes this dessert lactose-free, but also even more delicious as the coconut brings out the natural sweetness of the mango. This recipe offers ingredients and directions for both a raspberry version and a coconut snowflake cake. Light, ​refreshing, and served cold, this molded mixture of either raspberries or coconut milk along with gelatin, potato starch, sugar, and cream is a lovely way to end the meal on a hot summer night. Durian is known as "the king of fruits" and is very popular in Asian countries. It has a spiky exterior and thick, sweet flesh, making it ideal for adding to ice cream. When combined with egg yolks, vanilla essence, sugar, milk, and cream, this frozen treat is smooth and refreshing and will add a nice finish to a meal on a warm night. These Asian pears are steamed with a little surprise inside—before cooking, the cored pears are filled with honey and Chinese dates (also called jujubes). Then they are steamed and the tender pears are served warm for a dessert that is light and delicious. Although not an authentic Chinese dessert, no American-Chinese restaurant meal would be complete without fortune cookies. Beating the egg whites makes this batter nice and airy and the combination of vanilla and almond extracts brings a delicious sweetness and flavor to the treat. Of course, writing your own fortunes makes these cookies even more fun!